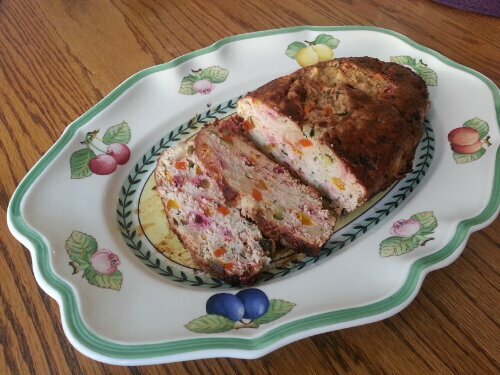 Turkey meatloaf with vegetables. This dish is one of my “comfort-food” items and I love the cheerful colors of the vegetables in it. This time I added some stems of red beats that added a brighter splash of color to it! What I like of ground turkey breast, besides the fact that is low in fat, is that you do not need to add eggs to the meat loaf to hold it together. This makes it a very good recipe for a low-cholesterol diet. Chop all the vegetables (ingredients 2 to 8) and cook them, until tender (about 15 min), in a pan with some olive oil and salt. Let them cool down. In a bowl mix the ground turkey, the vegetables, the softened bread squeezed, the chopped parsley, salt and pepper. Shape the mix in a loaf and coat it with flour. In a saute pan heat some olive oil and add the turkey loaf. Turn the loaf to brown all sides (about 10 minutes total). Then add some white wine. When the whine is evaporated lower the heat and cover with a lid. Keep watching and add some water if the bottom of the pan becomes too dry. Cook for 30 minutes. Alternatively you can bake the loaf at 180C for 50 minutes. I did not realize that about ground turkey. Thanks for the info.